Actually, I think we need both. No question, a better food safety regulatory policy is high on my priority list. Why? Because the food industry will never produce safe food voluntarily. It’s time to give regulation a try, and now is the time. While the window of opportunity is open, we need to convince Congress to act. To recap where we are on this: the House passed H.R. 2749, the Food Safety Enhancement Act last July. The Senate is currently considering S. 510, the FDA Food Safety Act. Some version of these bills seems likely to pass, although it is not at all clear by when. Although food safety advocates generally agree that we need a single food safety agency that integrates the activities of USDA and FDA, these bills are designed to fix the FDA alone, not the overall food safety system. For a quick take on the provisions of some of the bills under consideration, see the summary chart produced by the Center for Science in the Public Interest. The bills require science-based (HACCP-type) processes for producing food, starting on the farm. And at long last they authorize the FDA to order recalls or detain foods deemed unsafe. No, the FDA does not already have these basic tools. It needs them. One more time on HACCP: It means Hazard Analysis Critical Control Point with Pathogen Reduction. Translation: identify where in the production process contamination might occur, take steps to prevent contamination from occurring at those points, document that the steps were taken, monitor and inspect periodically to make sure the documentation is accurate, and test to make sure no contamination has occurred. Without much chance of getting a single food safety agency, fixing the FDA is a good thing to do. We can hope that once the FDA bill is passed, Congress will work on legislation to reconcile the inconsistencies in FDA’s and USDA’s food safety rules. But that cannot happen unless the FDA first has the ability to require science-based food production and can authorize recalls and detentions. This brings us to the problem of small farmers, or what regulatory agencies refer to as the “scale” (translation: size) problem. Steve Gilman, the policy coordinator for the Interstate Council of the Northeast Organic Farming Association (NOFA) sent me a copy of a letter to Senators signed by 70 or so members of the National Sustainable Agriculture Coalition. A two-track regulatory system based on the size, type, and diversity of a farm’s production. Rules based on level of risk (“fresh cut, ready-to-eat packaged fruits and vegetables pose a far greater risk than whole produce”). Scale-appropriate food safety training as outlined in additional legislation (introduced as S. 2758, The Growing Safe Food Act). I greatly favor support of small farmers. But I think all farmers – no exceptions – should be producing safe food. Thinking through a food safety plan is not that hard to do and farmers of any size operations should be carefully designing and diligently following HACCP-type plans appropriate to their specific situations. Farmers who produce foods unlikely to be cooked before eating — raw vegetables, raw milk, raw oysters, for example – should be testing for contaminants on some kind of regular basis at time intervals that depend on the level of risk. I think testing is so badly needed that I would add support of testing facilities to the Coalition’s legislative wish list. The scale issues are important and I hope the Senate will consider them seriously, incorporate them into the final legislation, and look for ways to support the food values outlined by the Coalition. But the fix-the-FDA legislation should not be held hostage to the scale problem. The FDA needs better methods for protecting the public from the hazards of industrial production methods. While making sure the FDA gets food safety authority, we need to work hard to get scale-appropriate rules or enforcement for smaller farmers who want to opt out of industrial food production, grow diverse crops, and produce them sustainably. In my previous post, I mentioned that a Cal Poly donor had written the university arguing that Michael Pollan should not be permitted to speak to students unopposed. The donor, Mr. David Wood of Harris Ranch Beef Company, wrote Dr. Warren Baker, President of Cal Poly, threatening to withdraw his promised $500,000 contribution if the invitation to Mr. Pollan was not withdrawn. I now have copies of the actual letters. They are well worth reading by anyone concerned about the relationship of industrial agriculture to its impact on soil and water, climate change, rural sustainability, air quality, animal welfare, worker safety, antibiotic resistance, and human health, as well as by the influence of Big Agriculture on public policy. Here is the letter from Mr. Wood to Dr. Baker. And here are Dr. Baker’s response to that letter and Mr. Wood’s response to Dr. Baker’s response. For too long now, those intimately involved in production of agriculture have silently allowed others (academics and activists) to shape their future. Not any longer! The views of elitists’ [sic] like Michael Pollan can no longer go unchallenged. Agriculture cannot allow the Pollans of the world to shape societal expectations (and ultimately policy makers’ decisions) regarding the production practices that can or cannot be employed by those whose livelihood depends on the continued development and adoption of modern agriculture practices. I will let this comment speak for itself. Note: thanks to all the people, especially Matt, who offered help with downsizing the letter file. Increasing concentration in agriculture: a problem? The Government Accountability Office (GAO), which does research in response to questions from members of Congress (in this case, Charles Grassley, Rep-Iowa), has just released a report on agricultural concentration and food prices. Concentration, for this purpose, has a specific meaning: the share of sales held by the four largest companies. Less than 2% of farms accounted for 50% of farm sales in 2007 (See Table on page 10). The top four concentration in grocery chains more than doubled from 1982 to 2005, from 16% to 36% (page 12). The concentration in meat also has nearly doubled. Beef concentration went from 41% to 79%, pork went from 36% to 63%, and poultry went from 27% to 57% (page 18). Only two sectors have become less concentrated: Wet corn milling (translation: high fructose corn syrup) from 74% to 69%, and breakfast cereals (86% to 78%). No wonder the Big Four Breakfast Cereals (General Mills, Kellogg, Post, Quaker) are so desperately pushing their wares these days. And do take a look at the figure on page 19, which illustrates the steady decline since 1980 of the proportion of the food dollar that goes to the farmer (from 30% to less than 20%), and the steady increase in the proportion going to food marketing (from 70% to more than 80%). The USDA must be really worried about all this. Thanks to Maya for telling me that USDA has teamed up with the Justice Department to take a look at legal ramifications of increasing agricultural concentration. Why? America does best with “a fair and competitive marketplace that benefits agriculture, rural economies and American consumers,” says the USDA Secretary. The Justice Department has its own interests in this matter: the anti-trust implications of food sector concentration. I’m guessing that Senator Grassley wanted GAO to demonstrate that agricultural concentration does not affect prices and, therefore, is good for consumers. Instead, the GAO report focuses attention on just how concentrated agriculture had become. Let’s keep a close eye on this one. 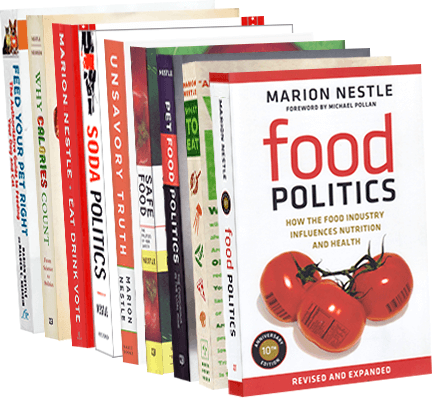 I’m always suprised when people ask me what I mean by “food politics.” What, they say, does politics have to do with food? Here’s a good example: European farm subsidies. These were originally supposed to promote farm production, but today the European Union drops $75 billion, at least a third of it for other purposes. As an investigative report in the New York Times explains, the biggest subsidies – just as in the U.S. – go to the wealthiest recipients. A typical small farmer in Romania gets $550. But the Queen of England and the Prince of Monaco get $700,000 or more, each, and Cargill, that needy company, got $14 million. And then there are subsidies like this one: €127,000 for Ligabue, a Venetian caterer, for sugar and dairy packets considered as exports because they are consumed on cruise ships? Why do I think politics enters into this somehow? The Pew Commission on Industrial Farm Animal Production (of which I was a member) recommended as its #1 priority the elimination of antibiotics for promoting growth and other unnecesary purposes in farm animals. I discussed this report in a previous post. There is much fuss about this issue this week because the House is holding hearings on the Preservation for Antibiotics for Medical Treatment Act. If passed, this will phase out the use of seven classes of antibiotics important to human health that are currently allowed to be used as growth promoters in animal agriculture. The FDA testified in favor of the act. So did members of the Pew Commission: Robert Martin, Fedele Baucio, and Bill and Nicolette Niman. So who could possibly be opposed to such a good idea? How about the American Veterinary Medical Association, for starters, apparently more worried about its members’ self interest than about sensible use of antibiotics. Maybe we’ll get lucky and the Congress will do the right thing on this one. Update July 16: Ralph Logisci, who helped staff the Pew Commission, posted a blog on the movement to ban non-therapeutic antibiotics on Civil Eats. It goes into considerable depth on the issues and is well worth reading. And the Institute for Agriculture and Trade Policy (IATP) has just produced a report on eliminating the use of non-thereapuetic antibiotics in, of all things, ethanol production. Who knew? Turns out they use antibiotics to control fermentation. Oops. Not a good idea. IATP says plenty of alternatives are available and the ethanol industry should adopt them. July 20 update: in case you haven’t seen it, here’s the meat industry’s July 9 statement in opposition to the bill attempting to ban antibiotic use.